Some pictures of my galley stoves. 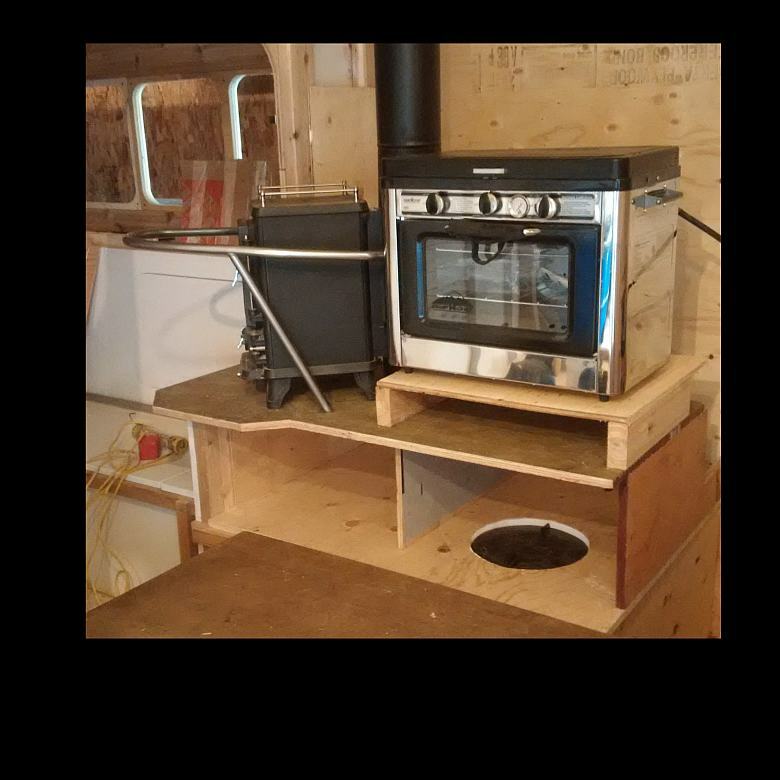 There is a Camp Chef two burner stove with a small oven, which can run on disposable propane cylinders or I have a converter hose to go to a 20 lb tank under one of the cockpit seats. I put a space under the Camp Chef for a drawer, which will bring the height up to be flush with the counter top. You can see the side of my protective bar, made from a pulpit from an old sailboat, and bent to shape. I was paranoid about stumbling into a hot stove when a rogue wave hit. 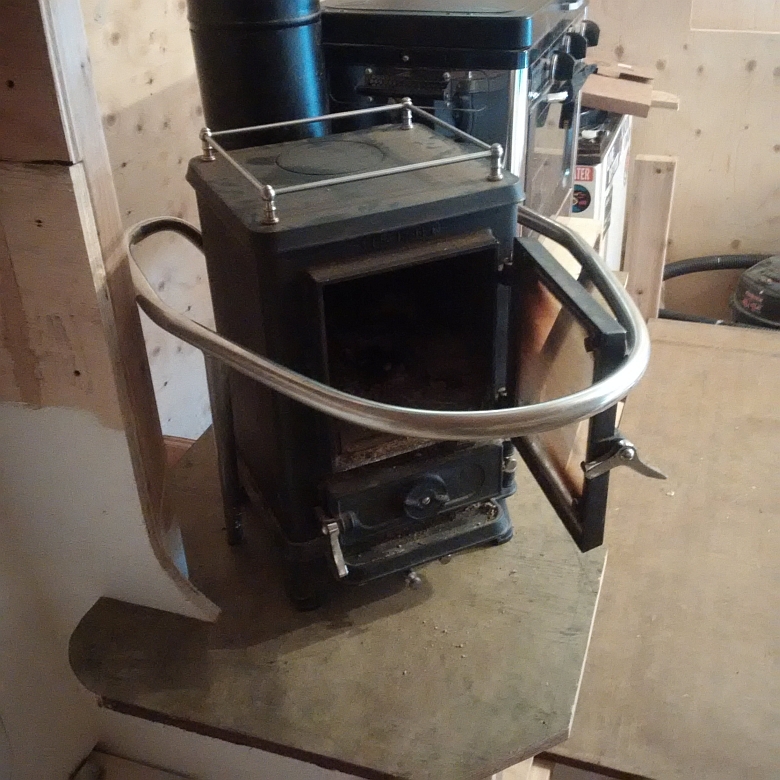 And here it is as seen from the dinette, i angled the stove so I can watch the flame while relaxing in the saloon. I have been working rather erratically on the boat since this spring. I had great plans that the progress would be much further along by now, but thing get in the way, and I am the only one working on this project, and it is my recreation, so I try not to get stressed about it. 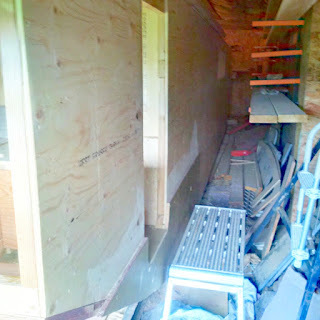 Anyways, I mentioned to Dave Zeiger, the designer of the Triloboats, that the installation of the door (in nautical terms I think it would be called a hatch) had taken longer to design, partially due to a lack of suitable examples on the web to copy. So I decided to post some pictures, despite the unfinished state of things. The reasons for a door is ease of access since the gunnels (the sides) are 5'4" off the bottom, and this boat is designed to be used either from a trailer like a very funky R.V., or dried out on a beach, and even when floating in the water. I originally was going to have a U shaped hole in the side, but was worried that it would cost too much strength, so changed to a hatch design. 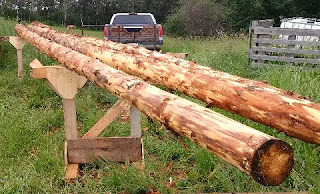 There is a vertical 2x6 topped by another 2x6 in a tee shape that runs the length of the boat. 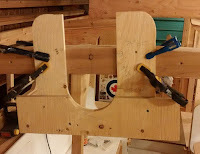 Glued inboard of the horizontal piece is a 2x4 the length of the cockpit to strengthen the opening and provides a nice place to sit on top of the gunnel. There will be door, opening outward, with the hinges on the forward side. The door will be slightly larger than the opening, with scuppers in the lower edge. The area immediately inside the door is sealed off, other than the self draining well just aft of it, which will hold the aft anchor. 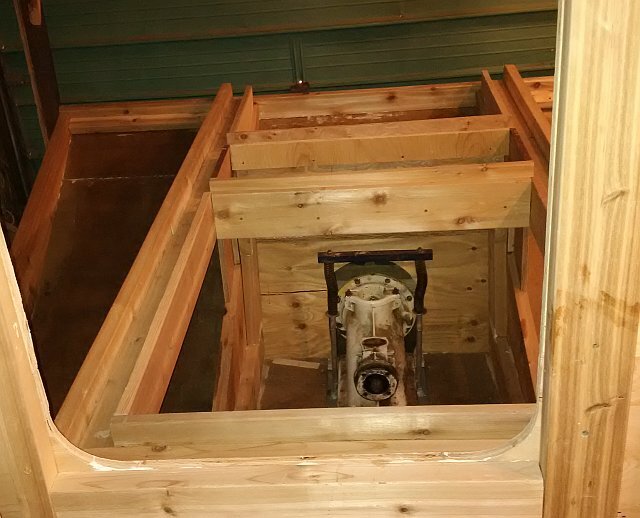 The plan is that any water that does get in here will flow harmlessly out. 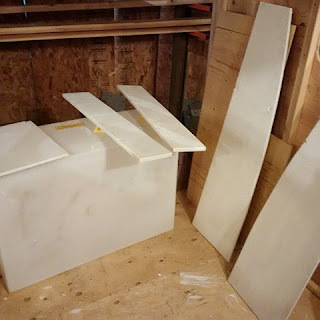 Dimensions of the opening are 18 inches wide by 44 inches tall, but might increase to 46 or so, so that I can put some nice curves at the top of the opening. The distance from the door to the windows in the saloon is 11 feet, so there is room to store a retracted lee board with out blocking the door or window. 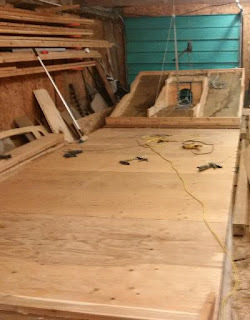 There is 32 inches to the transom, allowing an as yet unbuilt bench seat with leanbacks to be installed across the transom. 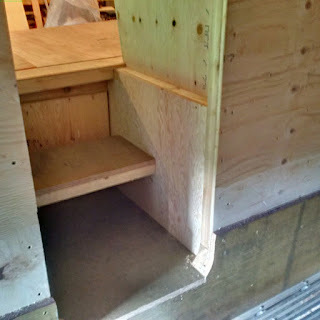 A folding floor hatch will cover the door well when sailing so that I don't fall in it on a bad tack. 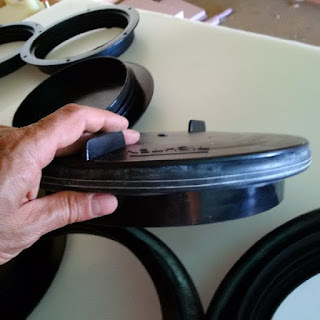 The doubler plate (Green 3/4 ply piece) is 24 inches, and the door is cut 6 inches into it, so the bottom of the door well is 18 inches above the bottom of the boat, or 6 inches above the design water line. Here is a view of the seat and leanback forward of the door, this is typical of the other seats around the cockpit. This one has a small propane locker on the forward edge, to hold the 20lb bottle that will feed the camp stove inside. 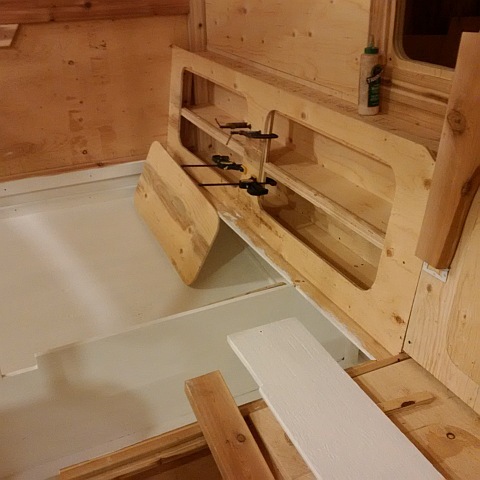 It will have a gravity vent so that any leaking propane will go overboard and not into the main cabin. The other compartment or lazarette has a false bottom, so I can empty it and climb down beside the engine if required to service it. 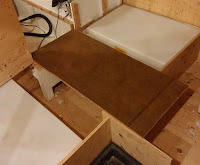 I have not built the seat hatches yet, but in the final picture you can see some pieces of ply that will become the seat and back sitting in place. 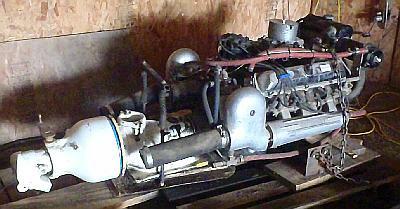 So my plan is to put this marine Oldsmobile 350 with Berkly Jet pump into my Triloboat. I don't need a 250Hp motor, but it was a fraction of the price of a 25Hp outboard and draws less water. Besides, if I ever want to pull a log off of a beach like Relic in the old Beach Combers series, this is just the motor I need. 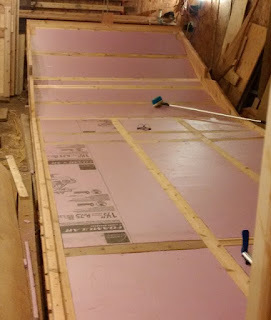 By request I am adding a picture of the floor insulation and framing. 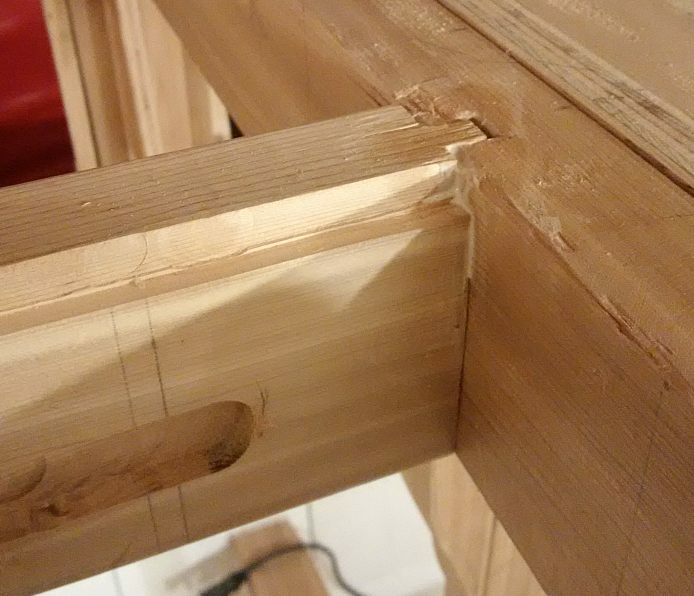 The edge has a 2x4 on edge, then half a 2x4 (ripped lengthwise) as a nailer. there are 2x4's (all 2x material is cedar) under each bulkhead, and under each seam in the plywood. Note that Dave Z does not insulate his floor this way, but I hate cold feet, so made the sandwich bottom. 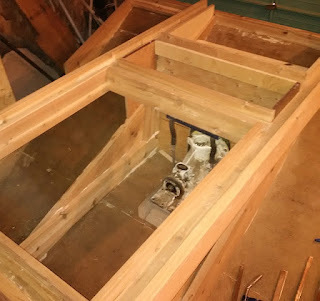 Today, 26 December 2016, I am working on the hatch coamings and assembling the first layer of the main cabin roof. Here is one of the carlines (I had to look up the correct name) notched into a slot cut into the bulkhead beam. There is a notch cut into the top inside edge, where a sliding screen will go to keep out bugs when the hatch is open. 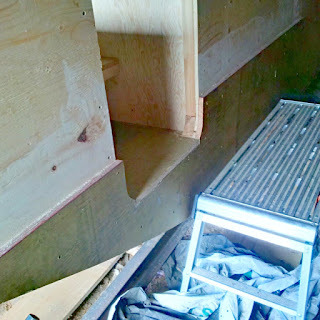 The larger slot below it is to hold a ladder, which will double as security bars when in the stowed position. 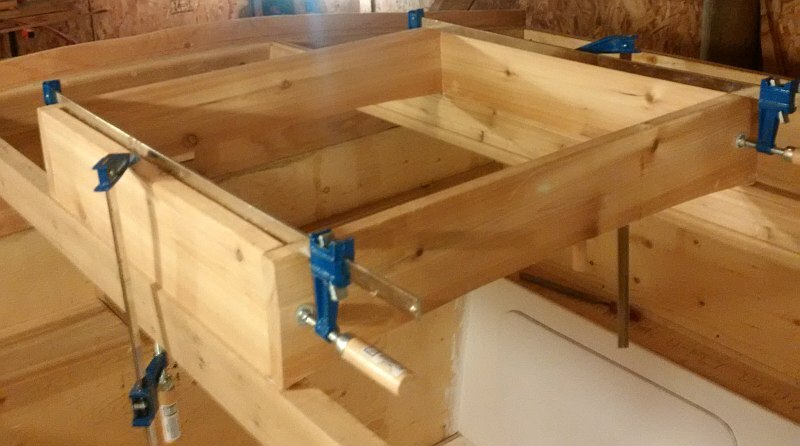 Hatch coaming being glued up on cross beam (carline). Handrails installed and being glued up. The top 1x4 will hide the seam in the plywood roof. 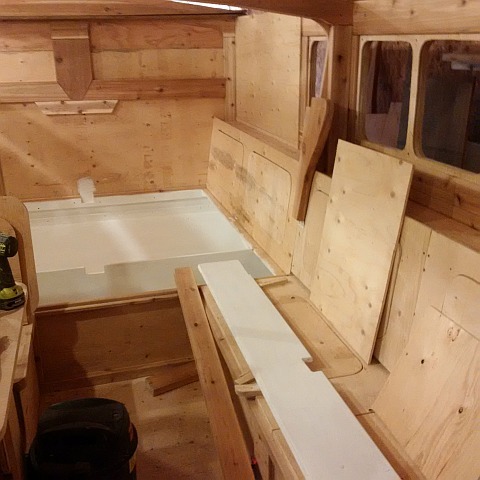 I have also been cutting and fitting the plywood that will become the galley floor. 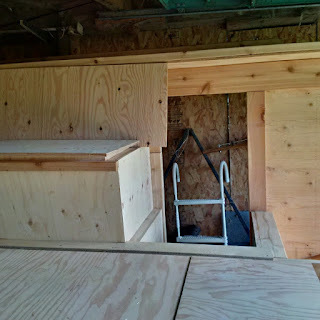 Here you can see the two 50 gallon fresh water tanks, and the piece of Form-ply plywood, which is removable to access storage between the tanks. Here the floor pieces are in place, with the shower pan just in the foreground. 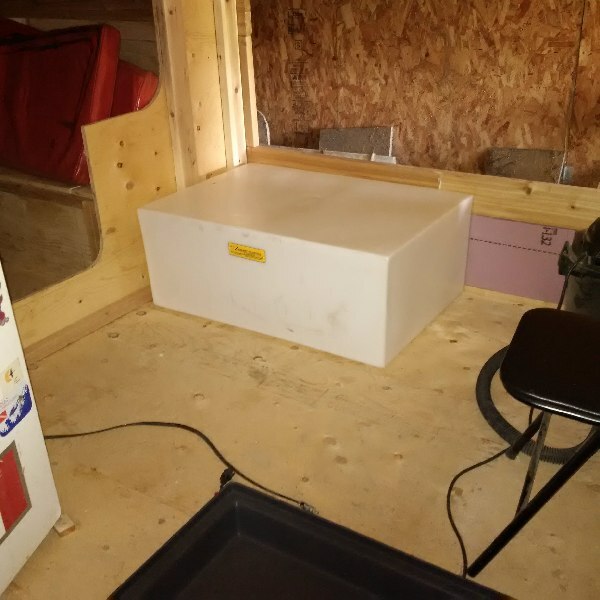 The bar fridge will be flipped on it's back and super insulated, directly above where it is sitting now. Before gluing any of these parts, I need to paint under the tanks and shower pan, then cut in the clean out hatches into the tanks, and the matching holes in the plywood to reach those hatches. The storage area under the front bunk has a bunch of small pieces that will enable the hot air from the stove area to be circulated around the cabin. 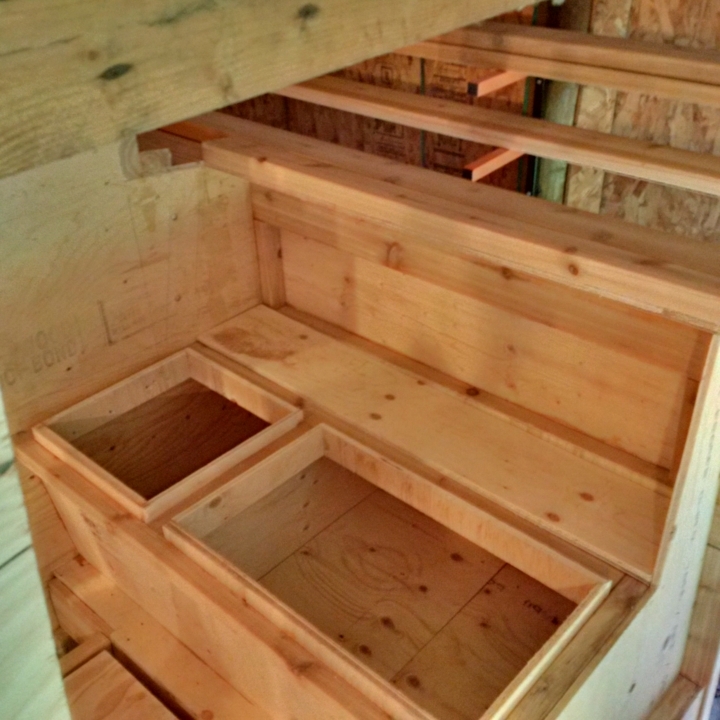 Here is a detail of the shelves on the starboard side of the bunk. I am gluing in some bits of wood to prevent the cover from collapsing inward when leaned on. Here is a shot of the paint (actually stain) that I am using. 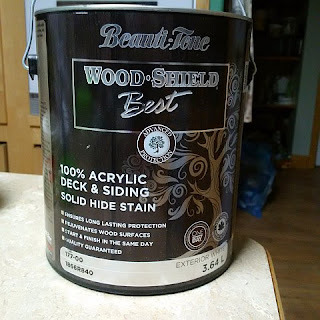 I am using an exterior stain so hopefully it will deal with any moisture without any problems. As a side note, my painting skills are more of "Fence Painter" then they are of "Glossy High Dollar Boat Painter", as I am using a brush, and seem to consistently err on the side of more paint then less. Also, I am painting over rough building plywood, that I have done very minimal sanding to. As long as there are no slivers and the wood is sealed, it meets my requirements. 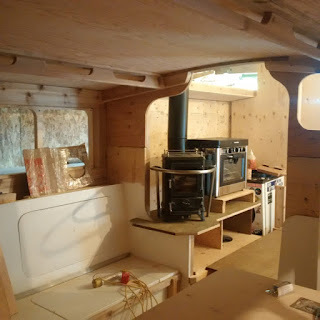 One day I may go back and refinish those areas that are visible, after I get the boat sailing and have a chance to laze around and critique the job, but I suspect that will be a few years off yet. I have not been working on the boat project for over a month now, the last I had done was to power plane the trees down to size. 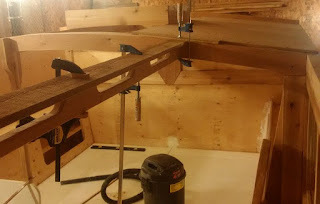 One mast was ready for sanding, and the other was 75% done when my power plane melted it's little drive belt. I have since replaced the plane, an extended story in itself. The plane is a discontinued model, and the belt I needed is also discontinued. However, because the product is not repairable due to this, they said I could replace it with a similar model, just bring it in with a receipt. It took me a while to locate the receipt, then drive to a store with stock, but they did a straight across the board exchange, with another identical old stock plane. Other projects and a trip interrupted further work, and I went out to look at the masts today, and I found a lot of vertical checking. The question I have is how much checking is too much? Buehler's Backyard Boatbuilding makes it sound like the checks are no big deal, but he was also talking about a mast that had been oiled. 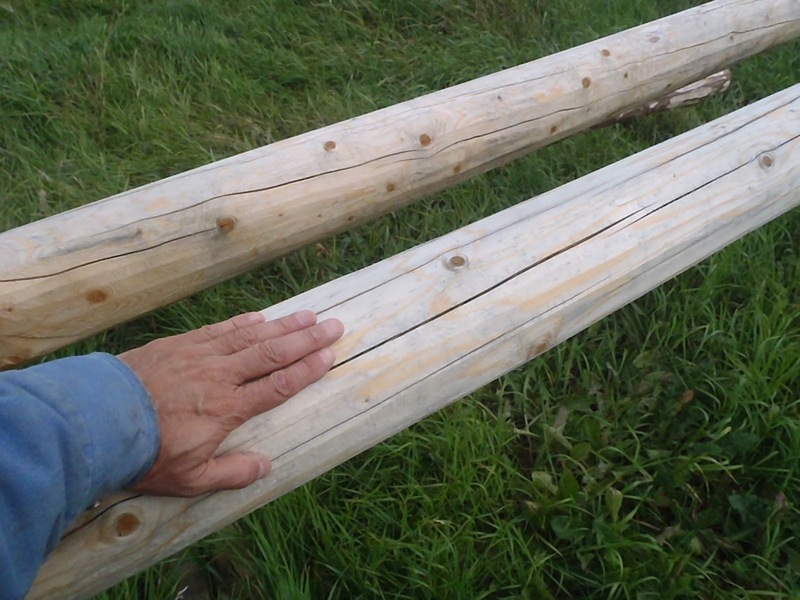 I also ask, if this mast is considered OK, do I just go ahead, finish sanding and paint it? Or would it be considered too weak, and I am better off to start over with a fresh tree? Feedback from anyone with mast making experience is welcome, as this is the first tree I have attempted to make into a mast. 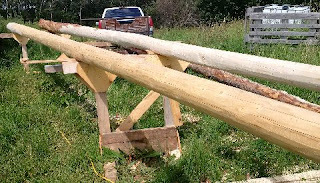 Note the spiral checking, really obvious on the one mast, I believe this is why the lumber guys left it for the firewood guys, hard to make a straight board from it. I think it is Tamarack, but am not 100% sure. 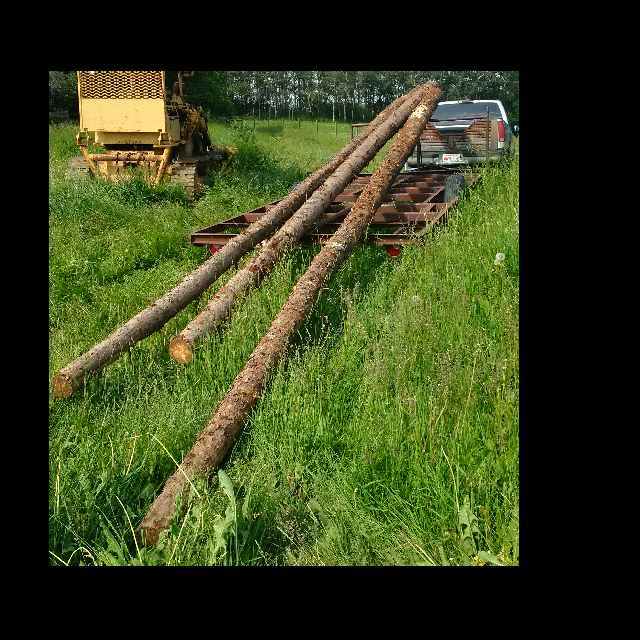 trees, and have done the rough work of converting them to "Organic Carbon Fibre" Masts. Of course, this is only going by what my high school biology teacher told me trees were made of, with a few years in between to make the memories a little fuzzy. Anyways, it is much easier to let Mother Nature do the layup of the carbon fibre than doing it myself. 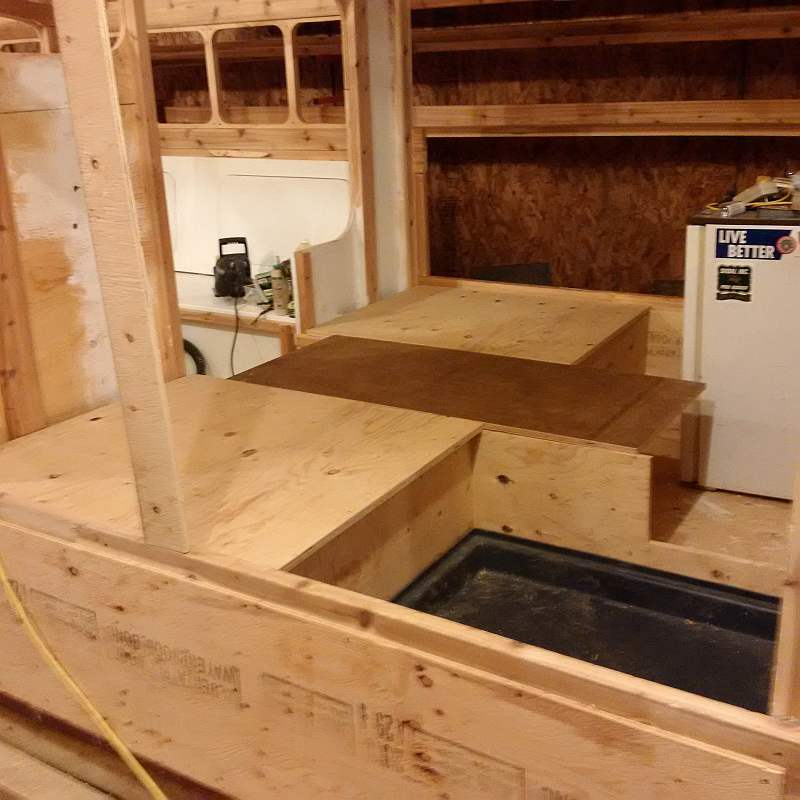 Also had to build some heavy duty saw horses for this step. I have the best pole completely power planed as the main mast, and the second best pole about 70% done, before the belt in my planer melted. I have just exchanged it on warranty, as the planer and replacement belt are discontinued, but one local store had some of the old stock still. 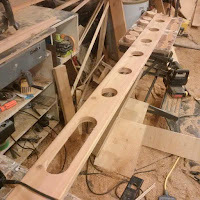 Next is to take the belt sander to the poles, cut to length, and put on a coat of paint. There is a third pole in case I find major flaws in the first two. I also bought two 50 gallon water tanks, here is a picture of the starboard tank in position, and at the bottom of the picture is a corner of a 4" deep 37x37" tray that will form my shower pan. 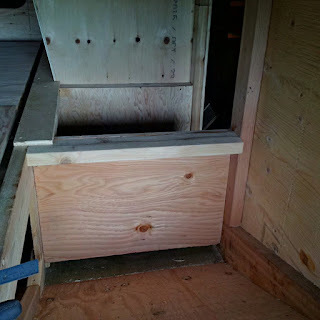 The pan will get a sump pump and an elevated grating to stand on while showering. Not shown is a 32 gallon tank that will be installed for grey water, when in a location that does not allow discharge.